It’s important for children to learn from an early age how food allergies affect them and the people around them so that they can keep safe and healthy. Read below for some effective ways to teach your children about food allergies. A great place to start when teaching your children about food allergies is to first begin by educating yourself. With the evergrowing expansion of educational videos available online for free these days, it’s quite easy to learn about a variety of important subjects including food allergies. In addition to educational videos, books in hardcopy and digital versions are available at the library or at most bookstores which can help you to understand more about all the elements related to food allergies. Furthermore, you can ask your doctor and communicate with people who have food allergies to learn from their experiences. Once you have a strong understanding of food allergies and the safety measures you should take with them, it’s time to share your wealth of knowledge with the kids. When it comes to teaching children, it is a wise idea to use interactive exercises which they can actively participate in to help engage their learning and comprehension. Simply handing them a book and asking them to read it, especially depending on their age, may not be the best solution and it could lead to limited understandings of food allergens. However, if you take the time to make learning fun, then you’re almost guaranteed that they’ll be happy to learn all about food allergies and how they can keep themselves and their friends safe. One of the most exciting learning activities for children to engage in is cooking. It’s fun for them because they get to eat delicious treats and they get to engage all of their senses to explore varying tastes, sights, smells, textures and more. Children enjoy helping out mom in the kitchen. It’s a positive situation where they can learn and be rewarded. This is a win-win situation for your child and yourself, because not only will you be teaching your kids about food allergies, you’ll be teaching them to cook and hopefully you’ll teach them about how easy it is to prepare healthy meals for themselves too. For example, if your child has a peanut allergy, it’s a great idea to teach them about alternatives to peanuts such as almonds, coconuts, dates, walnuts, cashews, soy and more. By interacting with your children in the kitchen, you teach them what foods look like raw and cooked. You teach them what to look for if they have a food allergy so they know how to keep themselves safe when eating outside of your home. Cooking with your children is hands down probably the best way to teach them about food allergies, but if you’re unable to cook with them, there are many other great resources available online and off which include illustrated books in digital and hardcopy formats. Videos about food allergies for children streamed online are another excellent way for your kids to learn. In addition to videos and books for kids, there are websites which have created customized educational puzzles and games they’ll want to play. Take the time to educate your child and yourself –with food allergies on the rise, it’s of the utmost importance to get educated and set in place life-saving safety practices. A food allergy bracelet is a smart choice for additional food allergy safety for both kids and adults. Food allergy alert bracelets don’t have to be ugly either. Online retailers such as StickyJ Medical ID sell allergy bracelets for kids and adults that are stylish – utilizing modern trends. Their allergy alert bracelets are also durable and affordable. Teaching and learning do not have to be a challenging, miserable task — find ways to make it fun. Get creative way; educate your children about food allergies and provide them with the tools they need to help keep themselves safe! Do you send to Australia ? If so what is price of postage? Yes, we do ship to Australia via Priority International and it costs 21.95. If you visit our website and find the item(s) you wish to purchase; you can always use the online chat to talk with our customer service department to help you with placing your order. Edgy Medical Bracelets in Time for Valentine’s Day! 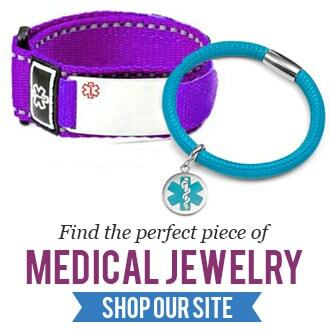 Trendy Medical Jewelry for Heart Conditions!